Why is the ACE study and building resilience important for policymakers? In a time of limited resources and growing needs, policy makers need to understand the causes of our deepest social issues and invest resources appropriately. Understanding the role of childhood trauma and the social costs that trauma creates in health care, drug and alcohol abuse, poverty, lost productivity, incarceration, and special education will drive informed social policy. Supporting programs that build resilience will reduce costs in treatment, education, criminal justice, and create a stronger society. Initially eight and then ten categories of adversity were included in the study because of their high prevalence in the KP weight reduction program: five directed toward children (physical abuse, emotional abuse, sexual abuse, and, later, physical neglect, emotional neglect) and five household issues (domestic violence to mother, separation, substance abuse, incarceration, significant psychiatric illness). Although other risk factors such as poverty, political and cultural trauma, etc. also affect illness and wellness, they were not analyzed in the ACE Study of KP members.The number of adversity categories experienced in childhood significantly predicted negative health and behavior outcomes, but it did not appear to matter much which categories were involved. The number of experiences within categories was not counted. How can policy be informed by the ACE study? 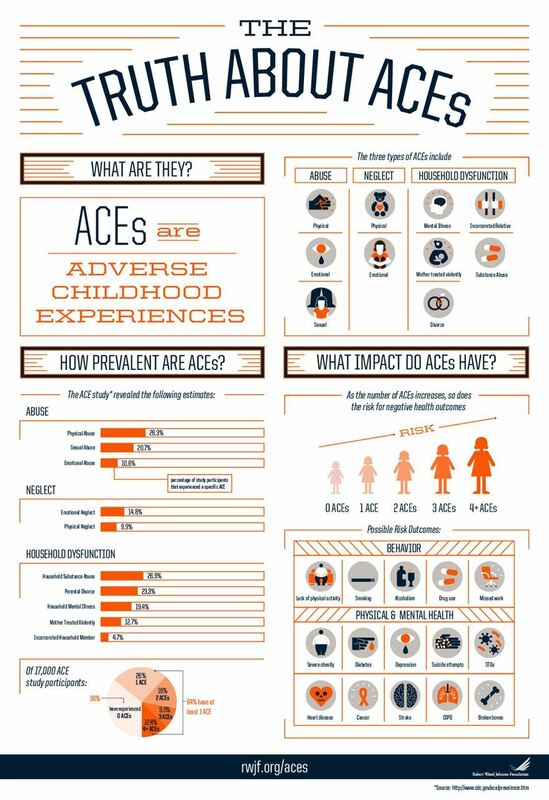 The Adverse Childhood Experiences (ACE) Study can brings cohesion and synergy to policy work with its findings that illustrate how the cumulative stress of ACEs can be a powerful determinate of the public’s health and a strongest common driver of mental, physical and behavioral health costs. Through the prevention and promotion of awareness of ACEs policy makers can help create informed policy that gets to the heart of the issues that create many health problems and in doing so be more effective with public dollars. Are there any examples of ACEs in Policy? How much do ACE-related outcomes cost and what return on investment can be expected for preventive interventions? The following table introduces ways to answer these questions. This table is a starting point for further analyses, as it is based on a number of statistical assumptions (e.g. independence or confounding of risk factors), multiple inferences about population characteristics (generalizing from ACE Study to Maine), and a variety of outcome data sources—all of which could be more precise. Within the table the Odds Ratio (OR) focuses on the individual and involves the increased statistical odds of a person with 4 or more ACEs having the outcome (it doesn’t predict that any specific individual will have the outcome). The Population Attributable Fraction (PAF) focuses on the group of people who experience the outcome and estimates the degree to which the outcome is attributable to having 4 or more ACEs. According to the data above, Maine spends over 3.5 billion dollars a year on outcomes relevant to ACEs, not counting lost work productivity (absent, not fully productive, etc.). It is estimated that over $500 million in expenses is attributable to those having 4 or more ACEs and that if even ¼ of those experiencing the above outcomes could resolve their impairment (to ‘not bothered’), the state could save $124 million annually. (i.e. the baseline)having the outcome. (i.e. there may be a variety of other factors that could also contribute to the outcome). 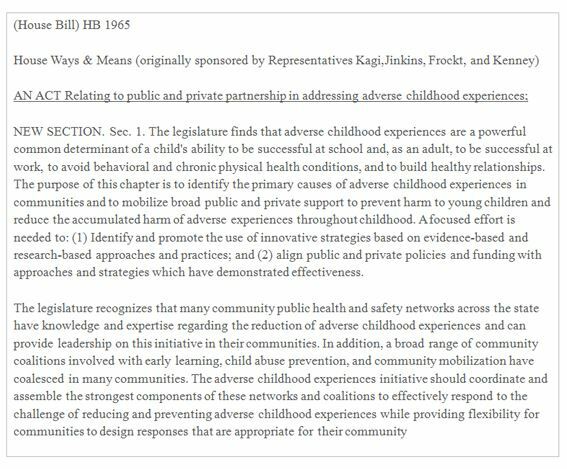 Our work to ensure that all children in California have access to the solutions and interventions they need to reduce the impact of Adverse Childhood Experiences and toxic stress took a major step forward today. The California Senate today passed Assembly Concurrent Resolution 155 with a 34-0 vote!